What if you could pray perfect prayers - prayers that would unleash the full power of God in your life and the lives of others? God has given you the power of His Holy Spirit alive and active in your life. His Spirit provides the means for you to pray the prayers to unlock all the power of heaven. In this pocket book Why You Should Speak in Tongues Norvel Hayes dispels confusion and brings to light the truth about praying in the spirit with the evidence of speaking in tongues. 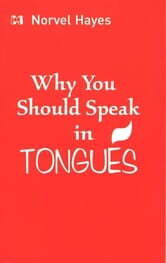 Read about the role of the God&apos;s Spirit in your life, break through the confusion surrounding the topic of speaking in tongues and learn to receive all that God has for you through the power of His Spirit. An excellent read. very well written. A challenging subject explained. Faith building. I would recomend this book to all Christians.